by Nathanson, Jerry A., M.S.,P.E. ; Schneider, Richard A., M.S.,P.E. The clear, up-to-date, practical, visual, application-focused introduction to modern environmental technology. 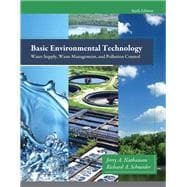 Now fully updated, Basic Environmental Technology, Sixth Edition emphasizes applications while presenting fundamental concepts in clear, simple language. It covers a broad range of environmental topics clearly and thoroughly, giving students a solid foundation for further study and workplace success. This edition adds new coverage of environmental sustainability, integrated water management, low impact development, green building design, advanced water purification, dual water systems, new pipeline materials, hydraulic fracturing, constructed wetlands, single stream municipal solid waste recycling, plasma gasification of waste, updated EPA standards, and more. Hundreds of clear diagrams and photographs illuminate key concepts; practice problems and review questions offer students ample opportunity to deepen their mastery. Math is applied at a basic level, and all computations are fully explained with example problems; both U.S. and metric units are used. Students with less academic experience will also appreciate this text's review of basic math, and its basic primers on biology, chemistry, geology, hydrology, and hydraulics.